The Chairman declared the meeting open at 1400hrs. Previous Minutes. David Gilroy covered the main points from the previous minutes. President. The President advised there were no new members in the past month. home and 2 hospital visits during June. out in September. The Roster period is 02-10 Nov.
cost of $200. More detail to follow. Membership. The current Sub-Branch membership stands at 201.
covering the hardships that Veterans were experiencing when leaving the ADF. Well worth watching. John will send a link to members. that Kristen Dillon is understudying as a Pensions Officer and was being mentored by Tony. Report Acceptance. Acceptance of the reports was moved by M. Barry and seconded by D.
L. Fisher after the meeting. Bowls Tournament on the afternoon of 11 Nov 18. A draft flyer had been prepared. membership. Moved: D. Gilroy Seconded: R. Lewis Carried. younger veterans with reference to both RSL Connect and RSL Active. Affairs provided positive news on where the Department was heading with a focus on the Veteran. Regional support particularly to younger veterans. Vietnam Veterans Day. A memorial service will be held at the Cenotaph at 1100 on 18 August 2018.
years. He will be sadly missed. Closure. There being no further business the Chairman declared the meeting closed at 1426hrs. Development Training at the Ok Tedi Mine in Papua New Guinea. The presentation was very well received. Opening. The Chairman declared the meeting open at 1400hrs. A copy of the Treasurer’s Report for May is at Annex A. President. The Acting President, John Dickinson, advised that membership stood at 204. He also welcomed the new members. home and 16 hospital visits during May. Remembrance Day noting that it was getting more difficult to get support from Defence. Public Relations. John Dickinson advised the damage to signage on the Rail Trail had been repaired. and invited input from the membership. Report Acceptance. Acceptance of the reports was moved by T. Wheal and seconded by Graham Fisher. confirm acceptance of this proposal. head a sub-committee with the intention of making contact with younger veterans on the Bellarine. join the RSL but at least make them aware of what the RSL can provide. level would need to be recommended by the Committee and approved at a General Meeting. Life” on closure of the meeting. Next Meeting. The next General meeting for Monday 16 July 2018 commencing at 1400hrs. Closure. There being no further business the Chairman declared the meeting closed at 1422hrs. Silent Tribute. In accordance with tradition, the Chairman asked that all those present to stand for the Ode and a minute’s silence in honour of those who had fallen in the service of their country or who had passed away since. 25 Members present (recorded in Attendance Register). 13 Members (recorded in Attendance Register). Previous Minutes. David Gilroy summarized the Minutes of the previous General meeting. Acceptance of the Minutes was carried on a motion by P. Cail, seconded by M. Barry. The Treasurer’s report was accepted on a motion by G Fisher and seconded by K. Hankin. Carried. Friends of the Bellarine Rail Trail letter reporting vandalism to signage. Friends of the Bellarine Rail Trail letter of thanks for donation. RSL Circular 16/18 – 2018 State Election Reminder. RSL Minutes State Trustee 22 Mar 18. RSL Minutes State Trustee Patriotic Funds. RSL Certificates of Appreciation for Appeals Volunteers. Letter of Thanks to CEO Transport Accident Commission. Letter of Thanks to Ocean Grove ANZAC Day Ceremony Guest Speaker. Letter of Thanks to National View General Manager. Letter of Thanks to View President. Reply to Marsh Advantage Insurance. Return of State Executive Ballot Papers. David Wilkinson reported the ANZAC Appeal sales had gone well with a total of $22,607.65 raised to be remitted to ANZAC House. Peter Cail advised that from his point of view the appeals roster had worked well. This was perhaps because more volunteers were getting familiar with Better Impact. He stated the total hours registered on Better Impact during April was 736.25 hours, 44% of which was attributable to the ANZAC Day Appeal. Brad Clark advised both the Ocean Grove and Barwon Heads ANZAC Day appeared to have gone well. He also stated that since Vietnam Veterans’ Day (18 August) falls on a Saturday the decision had been taken to commence the service at 1100hrs. The Secretary advised that guest speakers were required for both Viet Nam Veterans day and Remembrance Day. If possible, the Viet Nam Veterans Day speaker would be an ex-service person who had taken part in the Battle of Coral/Balmoral since this year is the 50th anniversary of that battle. Public Relations. Dickinson reported on the damage to the Rail Trail signage which had apparently occurred on ANZAC Day. The Committee agreed to repair the damage and to explore means of making the area less likely to be vandalised. Report Acceptance. Acceptance of the reports was moved by G. Fisher and seconded by D. Gilroy. Carried. David Gilroy advised that Denise Milich, who had organised the Christmas function for the Sub-Branch for some years, has decided to resign. A replacement for Denise would be sought from amongst the membership. The meeting expressed its sincere thanks to Denise for her fine work over the last few years. The raffle takings totalled $100 and $50 was won by L. Rose-Harmer. Next Meeting. The next General meeting for Monday 18 June 2018 commencing at 1400hrs. There being no further business the Chairman declared the meeting closed at 1432hrs. Thank you to all who attended to make the day a truly memorable one. 43 Members present (recorded in Attendance Register). 10 Members (recorded in Absent Register). Previous Minutes. David Gilroy summarised the Minutes of the previous General meeting. The Treasurer’s report was accepted on a motion by D. Gilroy and seconded by W. Gee. Carried. Yarraville RSL Sub-Branch Invitation to AZNAC Day. “Masters of War – AIF in 1918” Conference. ANZAC Day Church Service 2018. 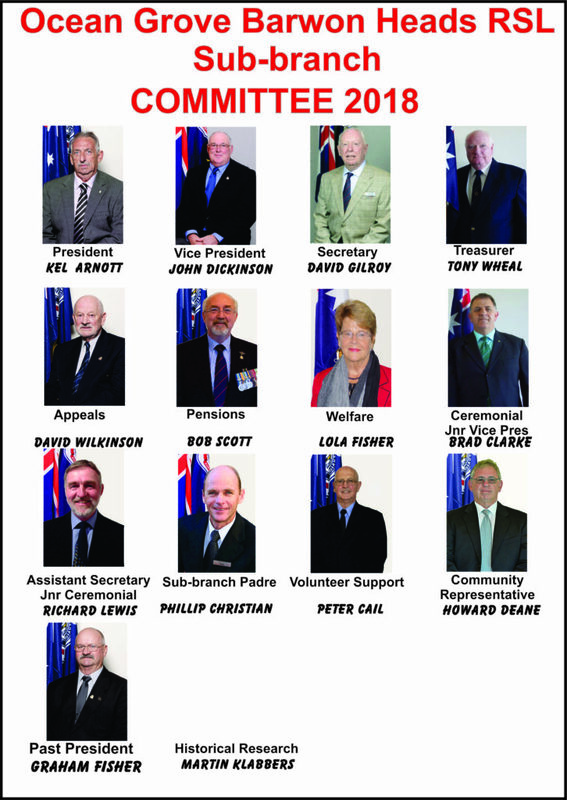 RSL State Executive Minutes – Feb 2018. Confirmation of Security for ANZAC Day. Confirmation of Audio Service for ANZAC Day. Conformation of Attendance at Ocean Grove and Barwon Heads ANZAC Services – Cr. S. Asher. Department of Justice – Police Checks. RSL Vic VA,W&AC Committee Minutes. Winter Escape to Philip Island. Service of HMAS Brisbane 1967-2001. Research Project Grant Application – Final. In the absence of the Welfare Officer the Welfare report was presented by P. Cail who noted that the total hours expended by the welfare team during April was 102.7hrs. Additionally, the welfare team had conducted 36 visits to aged care facilities, 18 visits to homes and 4 hospital visits. D. Wilkinson reported that all the ANZAC Day appeal five major selling points boxes had been stocked and were ready for distribution. Cash floats for these were also available. L. Woller advised that volunteers selling from the TAC site would have access to free parking in the TAC building underground carpark. Appeals Roster. Peter Cail advised that the ANZAC Day had all been filled. He requested that he be advised by e-mail of any changes to the rosters as they arose because of “no-shows” or replacement. This would ensure accurate recording of hours on Better Impact. He added that a total of 174 volunteers were registered on Better Impact but not all of these were involved in the ANZAC Day Appeal. His report concluded with a request that volunteers to fill short notice roster vacancies should see him after the meeting. Ocean Grove Dawn Service: Assembly 0600hrs, commence 0615hrs. Barwon Heads ANZAC Day Service: Assembly 0845hrs, march to commence at 0900hrs. Ocean Grove ANZAC Day Service: Assembly 0945hrs, march to commence at 1000hrs. Report Acceptance. Acceptance of the reports was moved by D. Wilkinson and seconded by L. Woller. Carried. Book “Best We Forget” by B. Clancy. Gilroy advised that Bernard Clancy’s had donated several copies of his book “Best We Forget” for distribution to the membership. The books had been signed by the author. Once a book had been read it should be returned to the Secretary for distribution to another interested member. Kokoda Youth Program. Gilroy announce that permission had been received from the State Branch Chief Finance Officer to pay the $6,000 for the Kokoda Youth Program from welfare funds providing the Sub-Branch was satisfied the recipient was related to a veteran. Replacement ANZAC Appeal Stocks. Wilkinson asked that requests for additional ANZAC Day Appeal stocks be referred to himself or K. Arnott who would arrange their distribution. He also mentioned that stocks of some items such as wristbands and luggage tags were being discontinued and would therefore not be available. Some of the new lapel badges such as the $50 Nurses badge and $30 Battle of Beersheba badge were in short supply and may not be available. However, previous years stocks were being substituted. The raffle takins totalled $154 and $77 was won by R. Smith. Next Meeting. The next General meeting for Monday 21 May 2018 commencing at 1400hrs. There being no further business the Chairman declared the meeting closed at 1428hrs. Previous Minutes. Richard Lewis read from a copy of the previous minutes. February Financial Report. A copy of the Treasurer’s Report for February is at Annex A. The Treasurer noted the high expenditure for Welfare Office Expenses during February and explained that most of the $2,864 consisted of $1,760 audit fee, $527 AGM refreshments, $312 AGM postage and $200 Gallipoli Youth Cup support. Kel Arnott welcomed two new members; Sue Arnott and Sylvia English. Kel also reported that much of the unwanted undergrowth along the Rail Trail Avenue of Honour had been removed and the area was much tidier and presentable as a result. Appeals: David Wilkinson reported ANZAC Day stock had arrived and he expected the distribution of it to the various selling points to be completed early in April. He tabled the posters available to advertise the ANZAC Appeal as well as a Certificate of Appreciation for volunteers who manned the selling points. He further reported on his attendance at an ANZAC Day Appeal meeting held in ANZAC House. At the meeting he formed the opinion that many sub-branches lacked a cohesive organisation to administer appeals and did not have access to adequate storage facilities for stock associated with the appeals. Peter Cail advised that the ANZAC Day rosters are available on the web site for volunteers to populate. He reported that the Sub-Branch has 163 volunteers registered on Better Impact including 25 View Ladies. Of the 110 positions available for ANZAC Badge sales 50% were already filled. Kel advised the membership that a band and bugler were still to be confirmed for ANZAC Day. A potential bugler has been identified but is still being negotiated. Kel also advised that an offer had been made for a fly past of three aircraft as a lead in to the march on ANZAC Day. Memorial Project. John Dickinson outlined the difficulties the research project were having in locating the names of locals from Ocean Grove, Barwon Heads and Connewarre for WWII, Korea and Vietnam. He also advised the criteria for identifying locals for the memorial would be the same criteria listed in the Australian War Memorial Roll of Honour. To assist with the costs associated with adding the names to the memorial, an application for a grant of $25,000 has been submitted. Report Acceptance. Acceptance of the reports was moved by T. Wheal and seconded by M.Klabbers. Carried. Next Meeting. The next General meeting for Monday 16 April 2018 commencing at 1400hrs. There being no further business the Chairman declared the meeting closed at 1423hrs. The Annual Christmas Luncheon was held on Dec 1st with 140 + veterans, members and guests enjoying a Christmas lunch with all the trimmings.The highlight of the day was a visit from Santa.